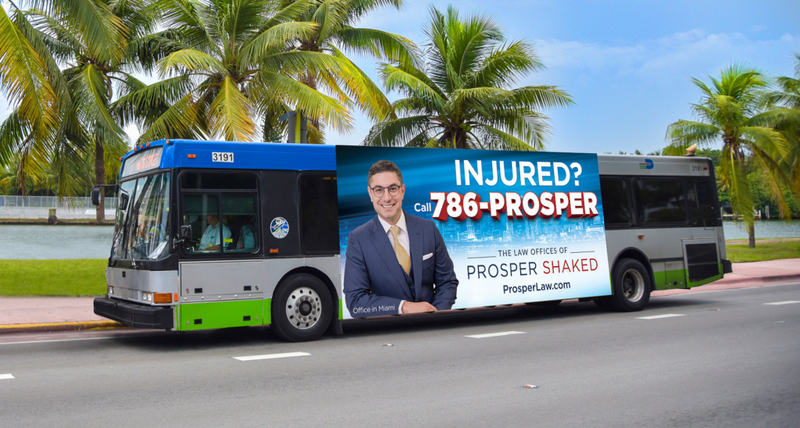 Have You Seen the 786-PROSPER Bus in Miami? You may have seen my advertisement on the side of buses in the Miami area and wondered who I am. My name is Prosper Shaked, and I am a personal injury lawyer serving victims of car accidents, slip and falls, medical malpractice, defective product injuries, and other accidents and injuries in the Miami area. If you or a loved one was injured, or if someone in your family was killed in an accident, call me to discuss your case. A Miami personal injury lawyer can help you understand your right to sue, what options you have for seeking compensation, and what compensation you might be entitled to in your case. If you or a loved one needs an injury attorney, the Law Offices of Prosper Shaked may be able to help. Call Prosper Shaked today at (305) 690-0244 to schedule a free legal consultation on your case. After an accident, you can feel lost and confused. You may understand the basic process of filing an insurance claim – or you may understand that a company or property owner should be held responsible for your injuries. However, you may not know how much your case is worth or how to get started with your claim. A personal injury lawyer can represent you and advise you on your options, help calculate how much your case should be worth, and help you fight your case. Your personal injury lawyer represents you, and any lawyer you hire has a legal obligation to provide you with advice and counsel on your case. If you talk to the at-fault parties in your case or are approached by their legal teams or insurance companies, it may seem like these people want to help, but you should not talk to them without consulting your attorney first. These parties do not represent you and are often trained to help avoid lawsuits by convincing you to accept a low settlement or urging you to file through insurance instead. Your lawyer can help avoid settlements that don’t cover your needs, protect your case from outside influence, gather evidence, build your case, and present it in court to get you the compensation you need. Nearly any incident where you suffer injuries can lead to a personal injury lawsuit. Some of these cases deal with intentional injuries, such as if you are the victim or assault or battery. However, it is much more common that these cases deal with “negligent” injury. The at-fault party owed you a legal duty. The at-fault party breached that duty by failing to use the proper care or skill. That breach of duty caused your injuries. The injuries you suffered include damages the court can order compensation for. In these cases, the specific duty will depend on the type of case and the specific circumstances. Generally, the duty uses an objective standard of “reasonableness,” and the duty is often to act as a person of reasonable prudence would in that situation. If you or a loved one suffered any of these injuries – or if someone in your family was killed in an accident – talk to an attorney about how to build your case and prove it in court. The financial compensation you can claim in a case is tied to the specific injuries and financial harms you face because of the accident or injury. The most common damages for personal injury are medical expenses, lost wages, and pain and suffering, but other damages might be available, too. Wrongful death cases also have their own damages you can claim. Medical expenses in an injury lawsuit typically include the damages from any ambulance rides, medical imaging (X-Rays, MRIs, etc. ), surgical procedures, hospital stays, doctor’s visits, rehabilitation, physical therapy, and other medical care you receive because of the accident. Lost wages commonly include wages you miss while you are recovering from the injury as well as wages you miss because of any disabilities or limitations the injury causes you. This can even include projected future earnings you will miss if you can no longer work or must take a lower-paying job. Injuries often cause severe pain and suffering. These damages are not usually available in an insurance claim, so you must file your case in court to get full compensation. These can be some of the highest damages you receive in your case. A loved one killed in an accident cannot be replaced with money, but the compensation you receive in a wrongful death lawsuit can still help to provide ongoing wages and replace the cost of services and support for your family. Wrongful death damages can also pay for burial and funeral costs and for intangible harms like lost companionship. Talk to a lawyer about what your case could be worth. If you or a loved one suffered an injury in an accident or because of someone else’s negligent or reckless conduct, contact Miami personal injury lawyer Prosper Shaked today. The Law Offices of Prosper Shaked represents injury victims and their families and works to get the compensation you need by filing lawsuits against the responsible parties. To set up your free legal consultation, call The Law Offices of Prosper Shaked today at (305) 690-0244.